Do you like learning about the universe around you and how it works? 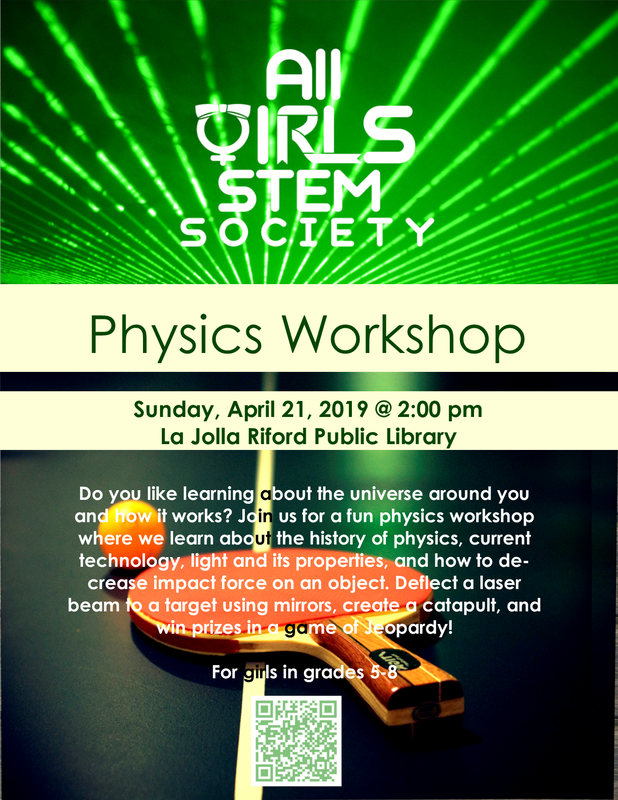 Join us for a fun physics workshop where we learn about the history of physics, current technology, light and its properties, and how to decrease impact force on an object. Deflect a laser beam to a target using mirrors, create a catapult, and win prizes in a game of Jeopardy! For girls in grades 5-8. Want to show off your math knowledge? Or improve your problem solving skills? Join us for an exciting math tournament where you’ll have the chance to compete individually and with friends. There will be medals and cool prizes (and cookies)! For girls in grades 3-8. ​Thank you to the Mission Valley Public Library for their support of the AGMT @ SD! Interested in designing your own computer game? We'll introduce you to programming through Scratch, a drag-and-drop language with conditionals, loops, and a cute cat! No prior programming experience needed, just bring yourself (and a laptop if you have one)! For girls in grades 3-6. 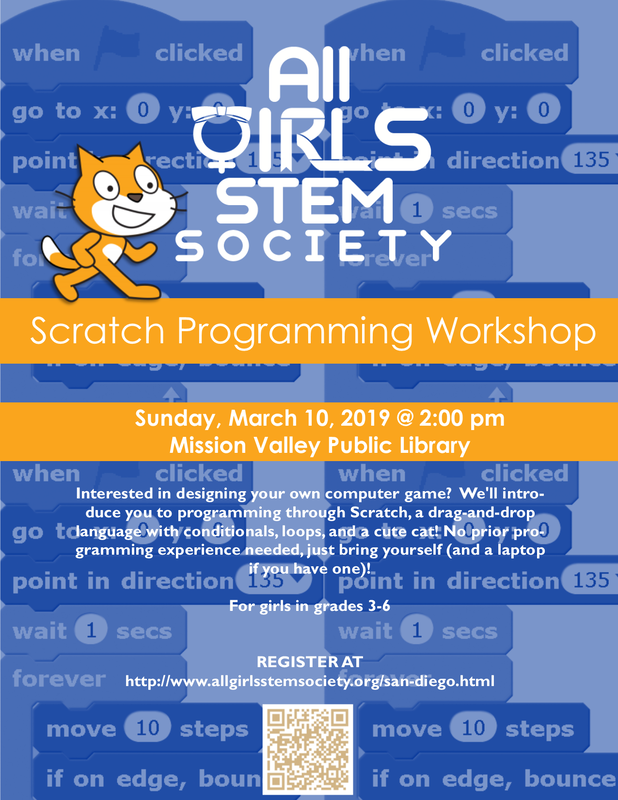 ​Thank you to the Mission Valley Public Library for their support of the Scratch Programming Workshop! Ever wondered what goes on inside your cells? Want to see for yourself? Learn about the basics of cell biology and organelles, then investigate them with your own eyes! Build origami microscopes and see everyday things like onions, potatoes, and leaves in a new light. For girls in grades 4-6. 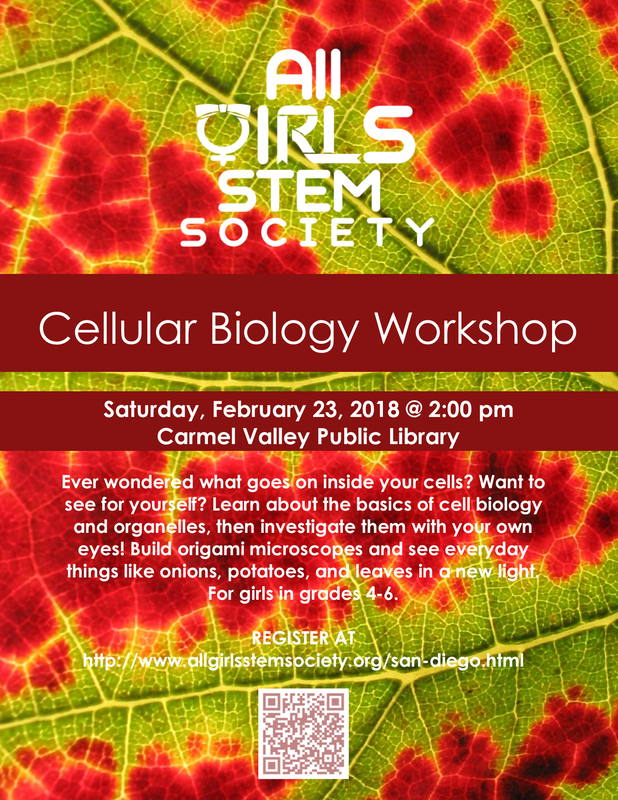 Thank you to the Carmel Valley Public Library for their support of the Cellular Biology Workshop! Have you ever wondered what really goes on in your brain? Learn about the basics of neuroscience, the anatomy of the human brain and the nervous system! There will be fun activities, Jeopardy, and plenty of opportunities to win prizes! 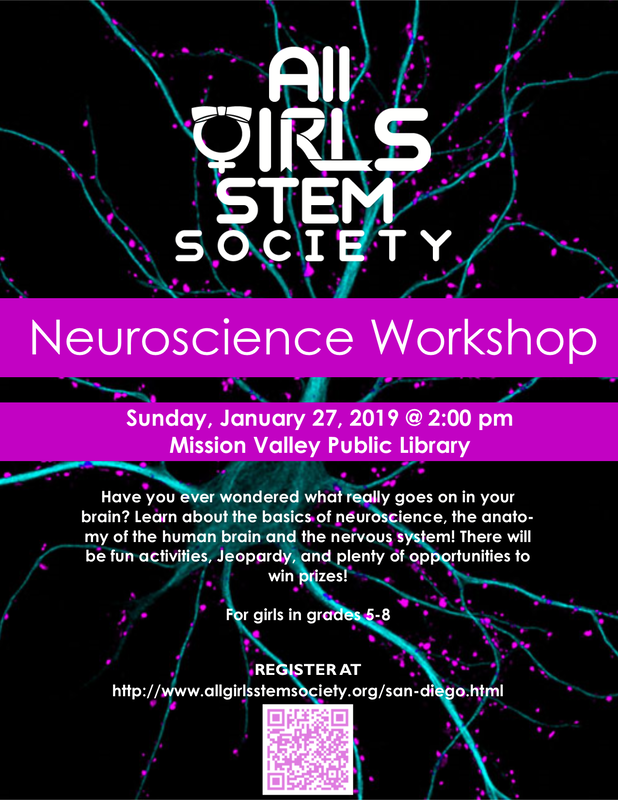 AGSS would like to thank the Mission Valley Public Library for their support of the Neuroscience Workshop! Are you interested in learning about space and the world around you? Join us for an exciting workshop about aerospace and its potential to change the world. Build space landers, launch rockets, and win prizes! We will also be having guest speaker Brian Keating, a professor from UCSD, speak about his work and exciting opportunities for women in the field. For girls in grades 4-8. 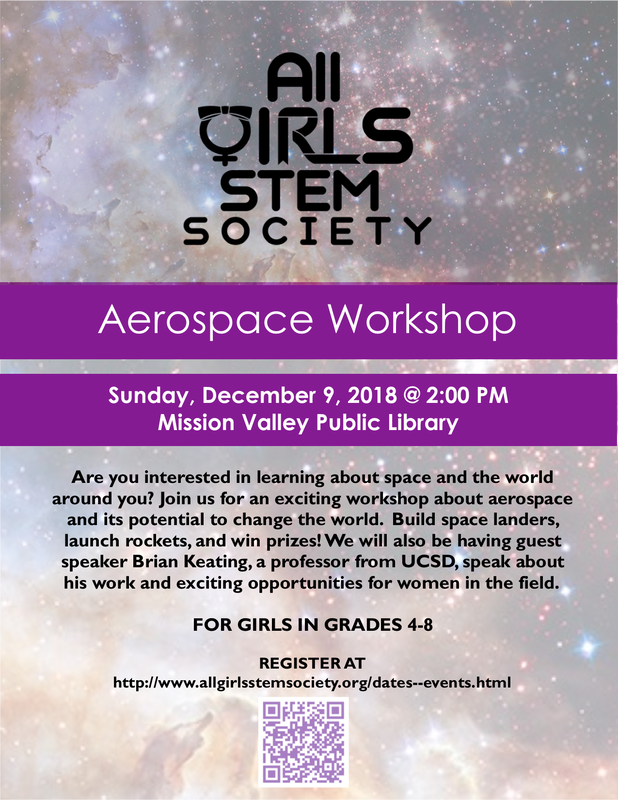 AGSS would like to thank the Mission Valley Public Library and Dr. Brian Keating for their support of the Aerospace Workshop! Have you ever wondered if there’s a better way to play rock, paper, scissors? Or why your friend always wins when you flip a coin? With game theory, you’ll study the probability of decision-making and chance, win prizes, and design your own simple game! 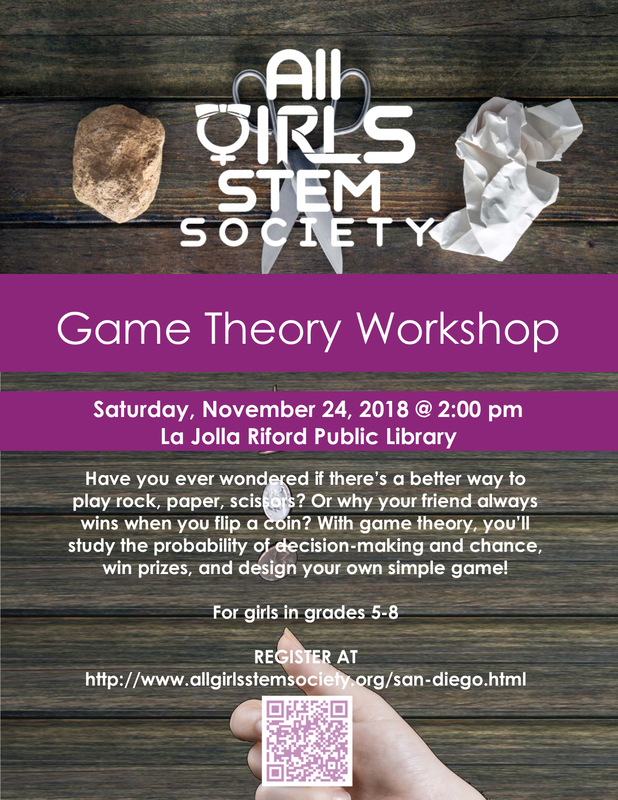 AGSS would like to thank the La Jolla Riford Library for their support of the Game Theory Workshop! Do you want to build and program autonomous robots with LEGO MINDSTORMS? Study the basics of mechanics, electronic design, sensors, and programming! Get ready for an awesome hands-on experience and team competition with LEGO cart. 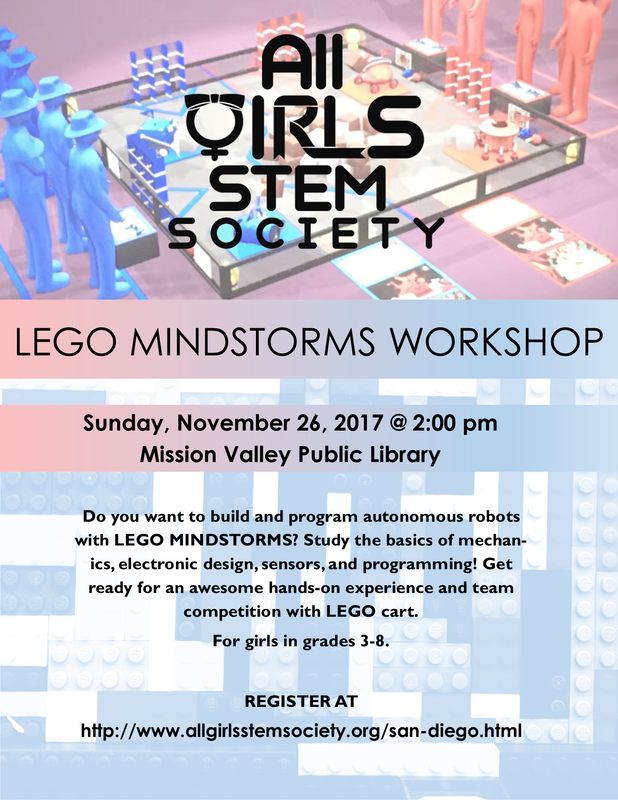 AGSS would like to thank the wonderful people of the Mission Valley Public Library for their support of the Lego Mindstorms Workshop! Want to learn why wind blows, or why containers break open at high elevations? Study all about the chemistry and physics of gases, and use this knowledge to make bottles jump off the table, fill bags with air in less than a second, and more! For girls in grades 3-5. 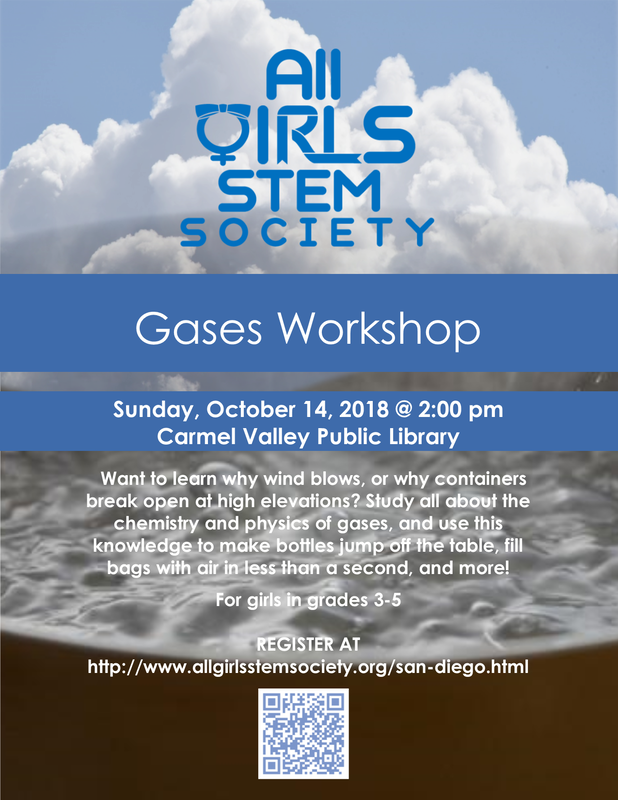 AGSS would like to thank the Carmel Valley Public Library for their support of the Gases Workshop! Want to explore math outside of the usual addition, subtraction, and multiplication? Learn about tying knots, mathematical proofs, DNA, and why the universe might just be shaped like a donut—with plenty of snacks, prizes, and lots of hands-on activities! 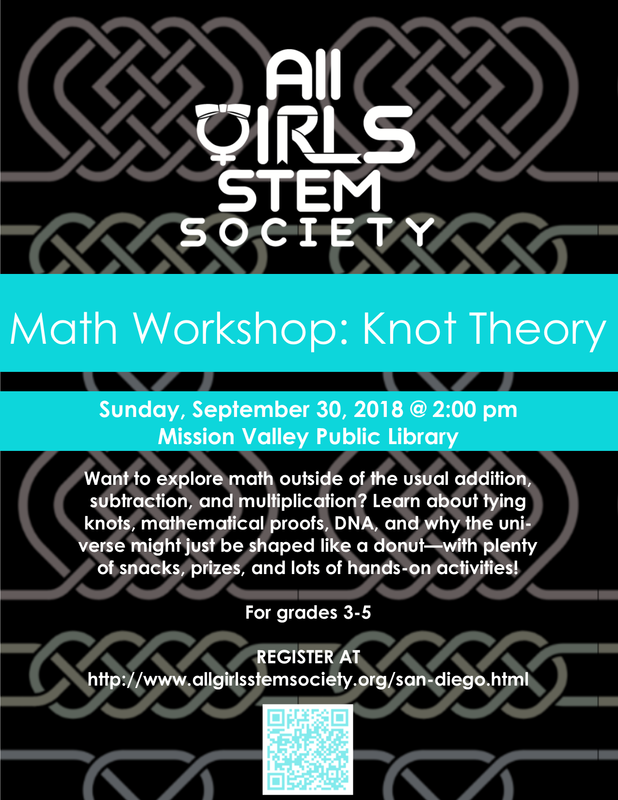 AGSS would like to thank the Mission Valley Public Library for their support of the Knot Theory Workshop! ​How does electricity work? What is the relationship between voltage, current, and resistance? Answer these questions with a series of hands-on experiments! Learn to read circuit diagrams and identify short-circuits, then build your own LED night lights and breadboard projects! AGSS would like to thank Mr. Heldt of The Bishop's School and the lovely people at the North University Community Library for their support of the Circuitry Workshop! An introductory Python programming workshop for girls in grades 3-8. Learn programming with Python’s Turtle class - draw faces, fractals, and more with digital turtles! For returning members, we’ll cover recursion and other advanced topics. Digital turtles to program with, and fun turtle erasers for prizes… so tons of turtles, programs, and prizes. AGSS would like to thank the Mission Valley Public Library for their gracious support of the Python Programming Workshop! For all girls in grades 3-8! 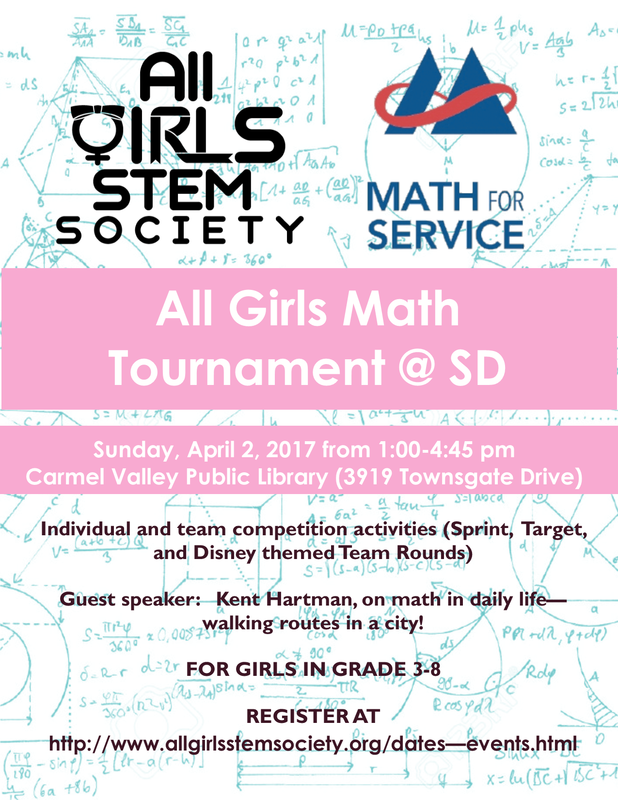 AGSS would like to thank Math for Service and the Mission Valley Public Library for their support of the All Girls Math Tournament! Discover the building blocks of life: What defines life? What are cells made of? Work together to solve puzzles, dissect flowers, witness photosynthesis, and extract strawberry DNA (what?!?!)! Have you ever wondered why oil and water don't mix or how dish detergent works? 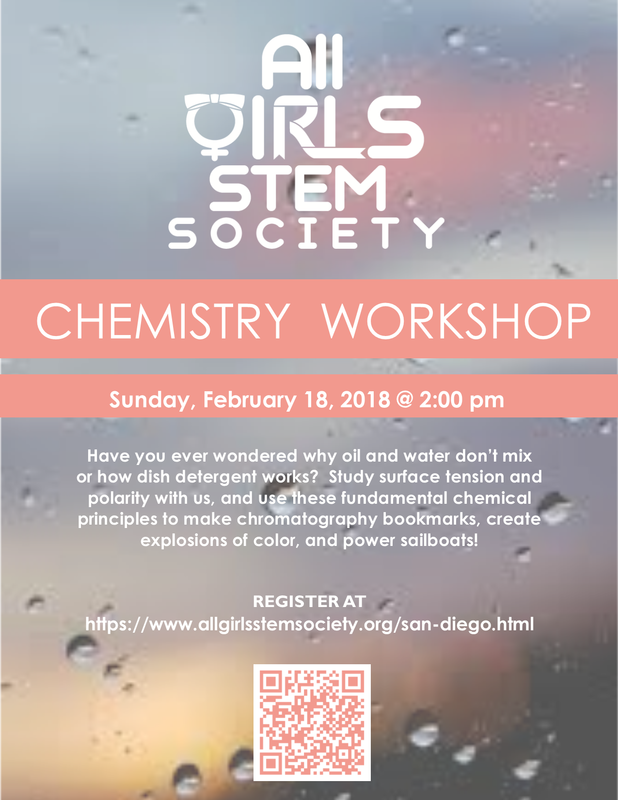 Study surface tension and polarity with us, and use these fundamental chemical principles to make chromatography bookmarks, create explosions of color, and power sailboats! ​​AGSS would like to thank the Carmel Valley Public Library for their amazing support of the Chemistry Workshop! How does electricity work? What is the relationship between voltage, current, and resistance? Answer these questions with a series of hands-on experiments! Learn to read circuit diagrams and identify short-circuits, then build your own LED night lights and breadboard projects! 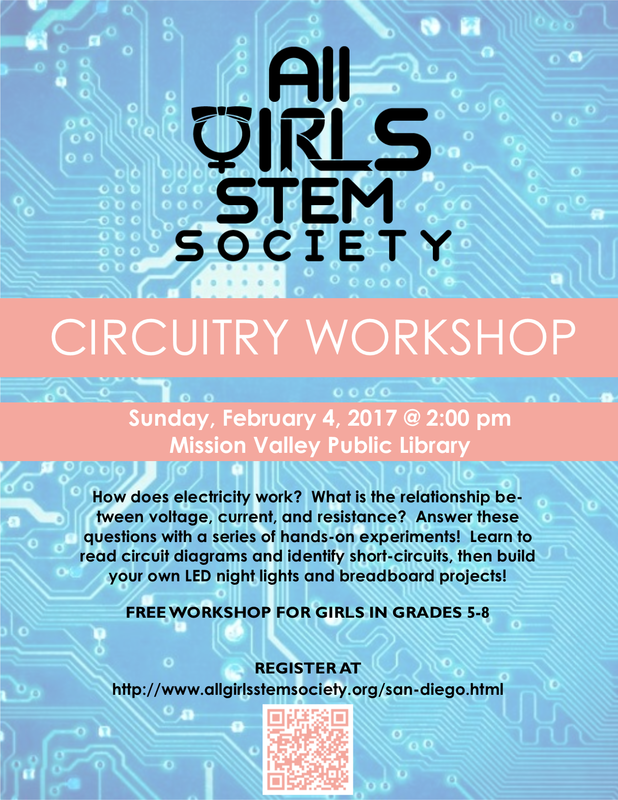 ​AGSS would like to thank Mr. Heldt of the Bishop's School as well as the Mission Valley Public Library for their wonderful support of the Circuitry Workshop! ​Get ready for an awesome hands-on experience with Scribblers (the S2 robot by Parallax)! Make these robots sing, dance, draw, and send messages! An introduction to robotics with a drag-and-drop programming language. 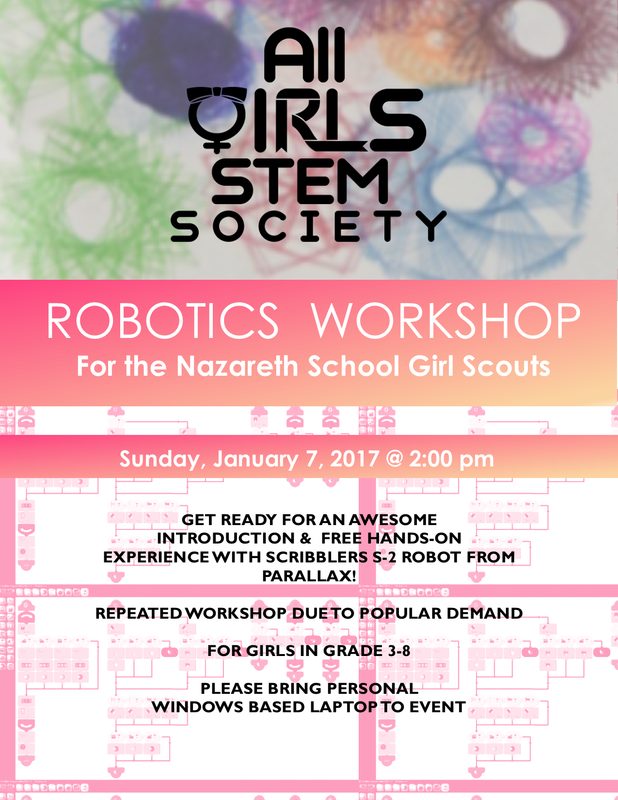 ​AGSS would like to thank Mrs. Shirley Miranda and the Mission Valley Public Library and the Nazareth Girl Scouts Troupe for their amazing support of the Robotics Workshop! ​Want to explore math outside of the usual addition, subtraction, and multiplication? Learn about tying knots, mathematical proofs, DNA, and why the universe might just be shaped like a donut — with plenty of snacks, prizes, and lots of hands-on activities! ​​For girls from grades 3-5. 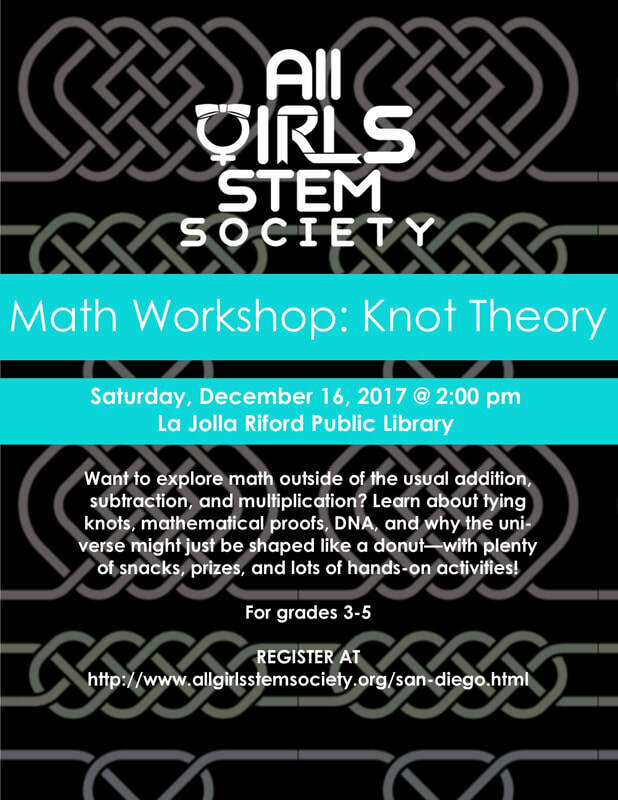 ​AGSS would like to thank the La Jolla Riford Library for their gracious support of the Knot Theory Workshop! Do you want to build and program autonomous robots with LEGO MINDSTORMS? Study the basics of mechanics, electronic design, sensors, and programming! Get ready for an awesome hands-on experience and team competition with LEGO cart! AGSS would like to thank FTC teams Clueless, Inspiration, and Rise of Hephaestus and the Mission Valley Public Library for their gracious support of the Lego Mindstorms Workshop! Get ready for an awesome hands-on experience with Scribblers (the S2 robot by Parallax)! Make these robots sing, dance, draw, and send messages! An introduction to robotics with a drag-and-drop programming language. 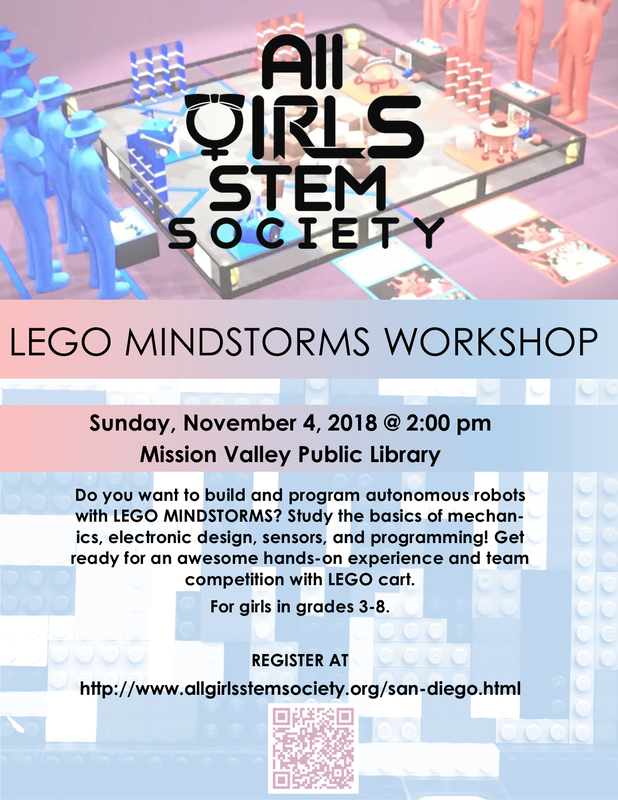 ​AGSS would like to thank Mrs. Shirley Miranda, Parallax and the Mission Valley Public Library for their gracious support of the Robotics Workshop! ​Have you ever wondered why oil and water don’t mix or how dish detergent works? Study surface tension and polarity with us, and use these fundamental chemical principles to make chromatography bookmarks, create explosions of color, and power sailboats! For girls from grades 5-8. AGSS would like to thank North University Community Branch Library for their gracious support of the Chemistry Workshop! For girls from grades 4-8. 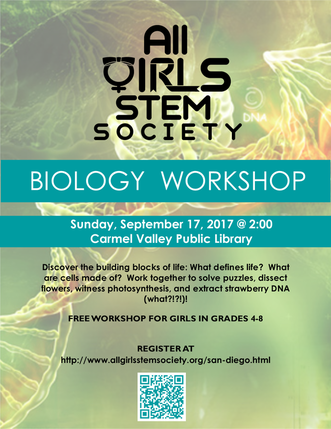 AGSS would like to thank Carmel Valley Public Library for their gracious support of the Biology Workshop! Learn about the solar system, the sun, and in particular, the history, mathematics, and science behind solar eclipses, as well as the social aspect of observing them. Join us for a talk by guest speaker, Eric Sprunk, and a fun, hands-on collaborative project: pinhole cameras! For girls from grades 3-8. ​AGSS would like to thank the Carmel Valley Public Library for their gracious support of the Astronomy Workshop! Study basic physics as well as real aerospace terminology and concepts used in the industry today. Learn about engineering principles such as lift, drag, and thrust by launching your own paper rocket and building a shock absorbing system! 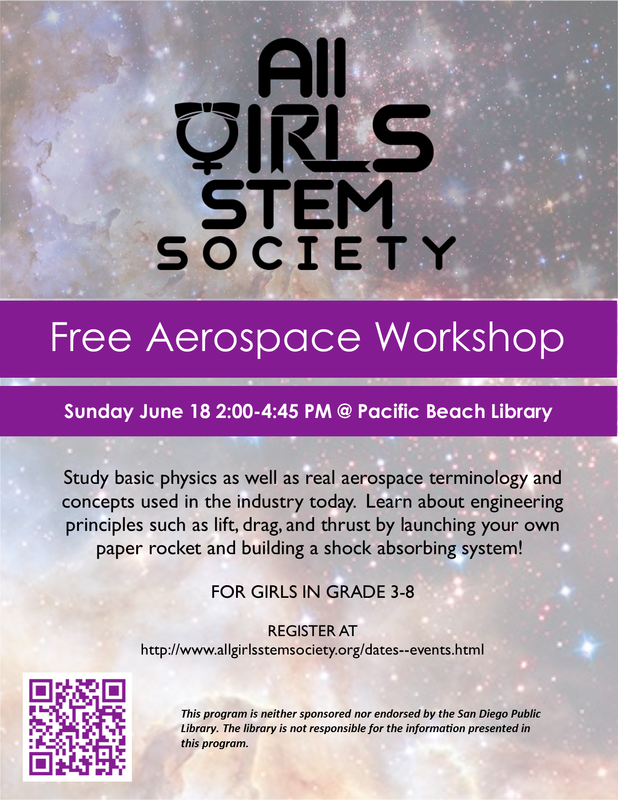 ​AGSS would like to thank the Pacific Beach Library for their gracious support of the Aerospace Workshop. AGSS would like to thank Mrs. Shirley Miranda and the North University Library for their support! In this hands-on, interactive workshop, students from grades 3-8 will develop an intuitive understanding of 3D shapes and explore the finer details of spatial geometry. Through creative work with paper (and paper insects! ), participants can develop their understanding of math and geometry and work with peers in a fun, supportive environment. AGSS would like to thank the San Diego Public Library for their wonderful support of STEAM! 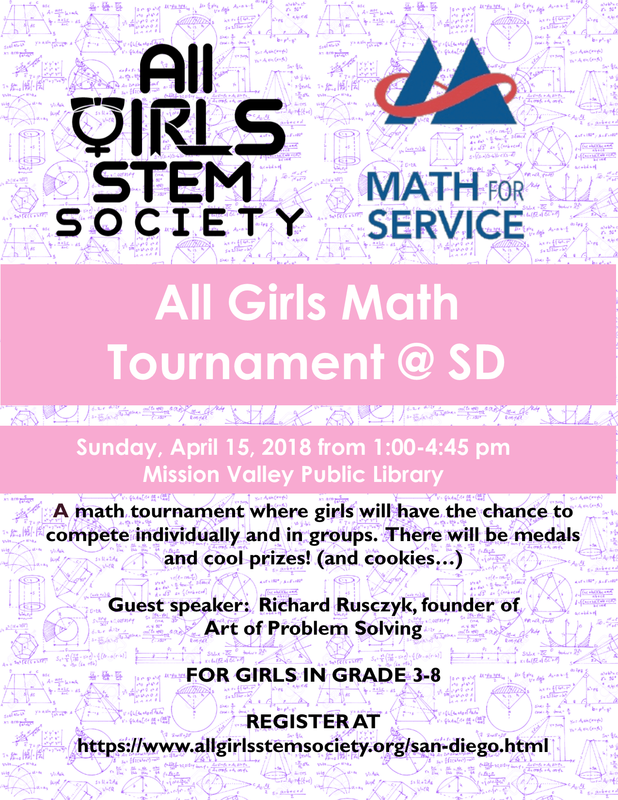 All Girls STEM Society and Math for Service are proud to present the 3rd annual All Girls Math Tournament @ San Diego! 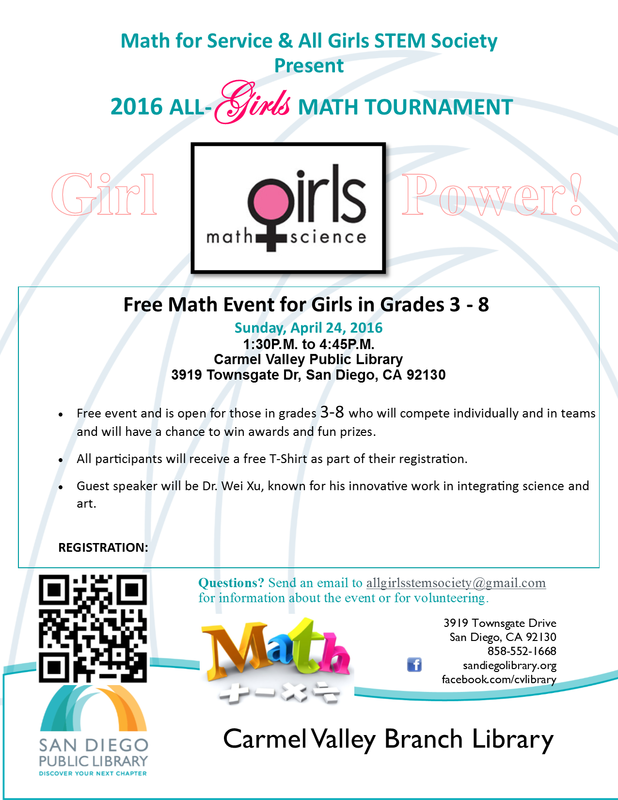 Look forward to a fun math tournament where girls will have the chance to compete individually and in groups. There will be a chance to win medals and cool prizes. Look forward to cookies, a Disney themed team round, and a lots of other cool math! This event is open to girls in grades 3-8. AGSS would like to thank Math for Service, Qualcomm, ARRIS and Wolfram for their gracious support. 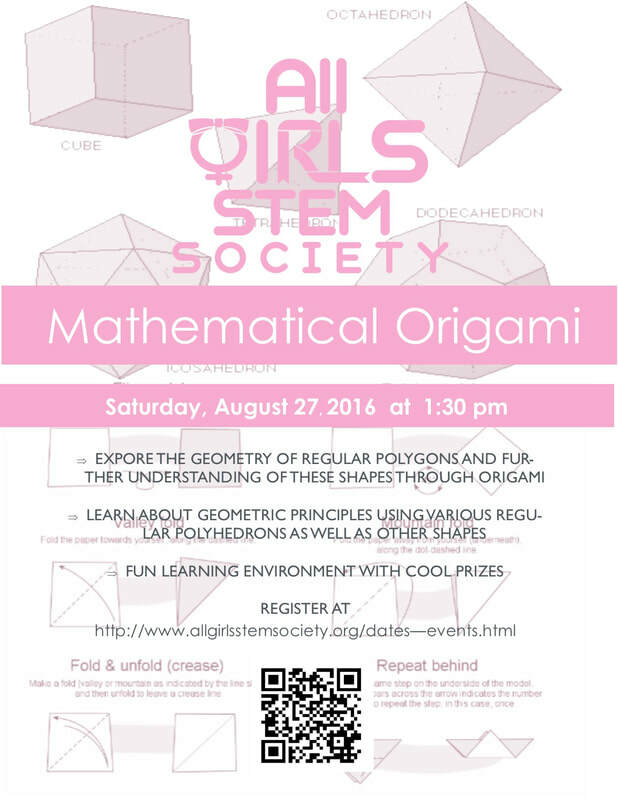 ​Join All Girls STEM Society for another fun day of math! Learn math fundamentals, such as decimals, percentages, fractions, word problems, order of operations, and basic variables, then practice creative mathematical thinking with math competition problems on these topics. Also, work together to solve problems in the final team relay and win cool prizes! 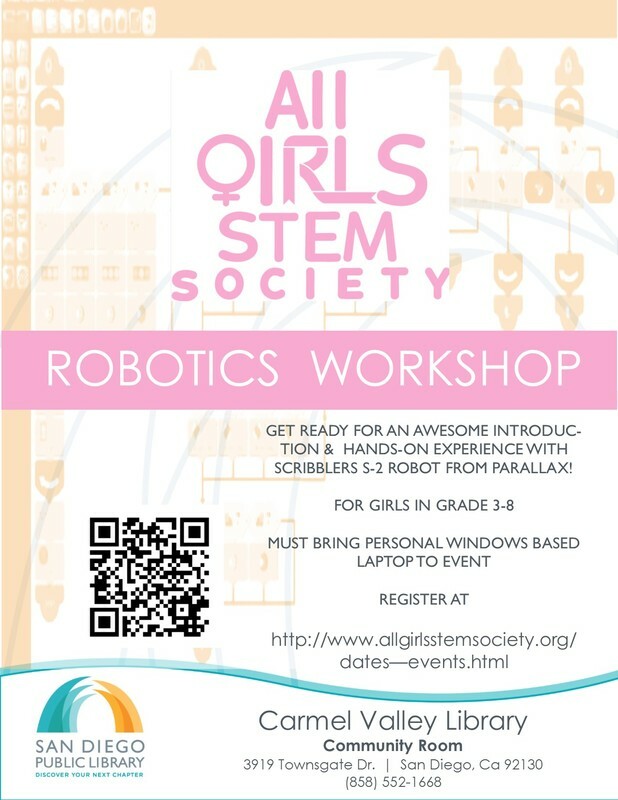 This specific workshop is for girls in grades 3- 5. ​AGSS would like to thank the San Diego La Jolla Riford Library for its gracious support of the Math workshop. 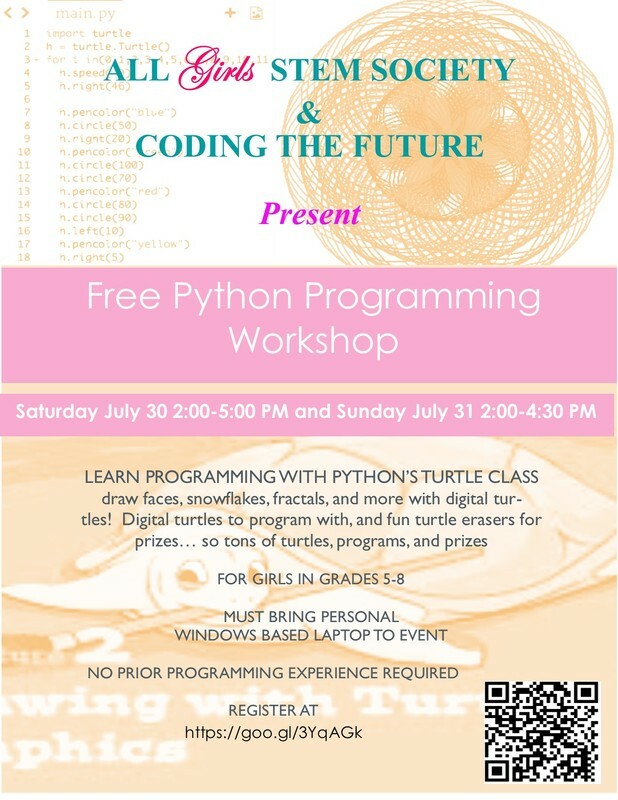 All Girls STEM Society and Coding the Future presents: Python Programming with Technical Turtles, an introduction Python programming workshop for girls from grades 6-8. 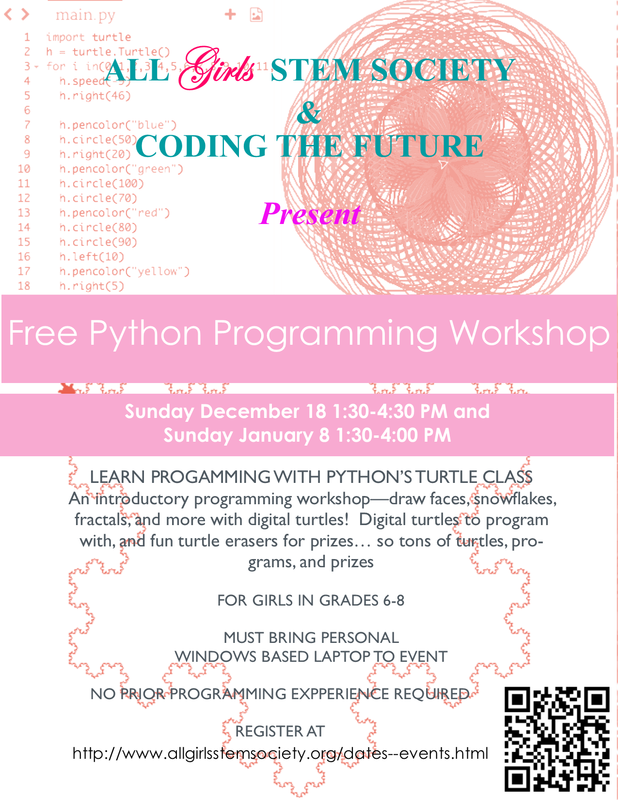 Learn programming with Python’s Turtle class - draw faces, snowflakes, fractals, and more with digital turtles! Digital turtles to program with, and fun turtle erasers for prizes… so tons of turtles, programs, and prizes. ​AGSS would like to thank the San Diego Carmel Valley Public Library for its gracious support of the Python Programming Workshop. 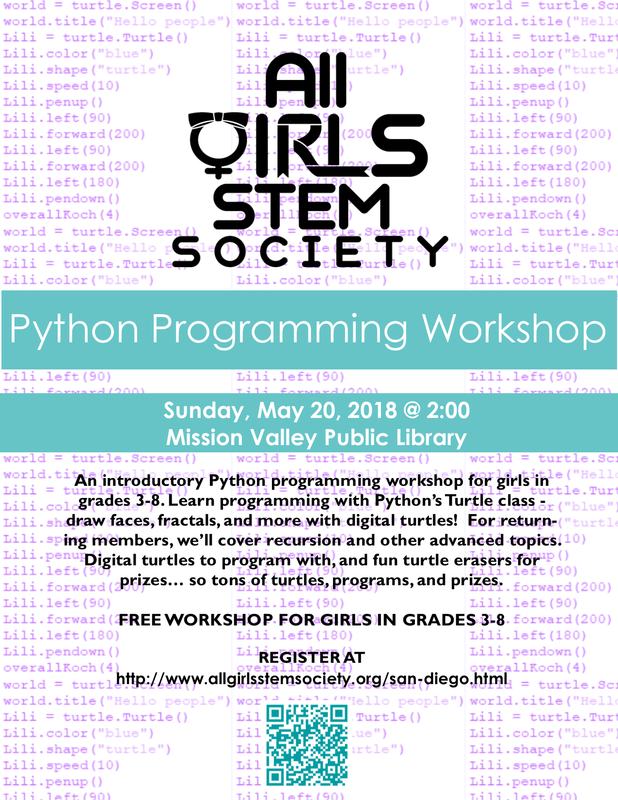 All Girls STEM Society and Coding the Future presents: Python Programming with Technical Turtles, an introduction Python programming workshop for girls from grades 3-5. Learn programming with Python’s Turtle class - draw faces, snowflakes, fractals, and more with digital turtles! Digital turtles to program with, and fun turtle erasers for prizes… so tons of turtles, programs, and prizes. AGSS would like to thank ARRIS and the San Diego Carmel Valley Public Library for its gracious support of the Python Programming Workshop. 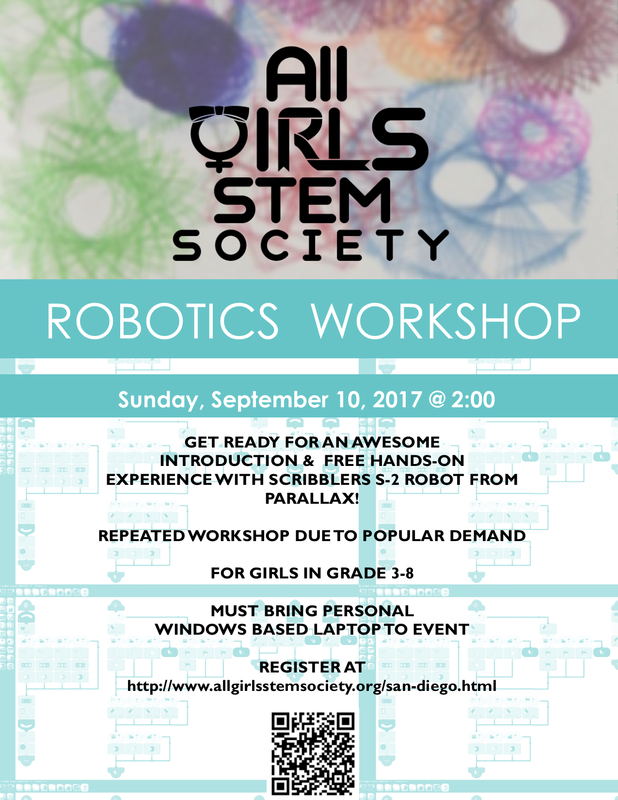 AGSS would like to thank Ms. Shirley Miranda, ARRIS, Parallax and the San Diego Carmel Valley Public Library for its gracious support of the Robotics Workshop. 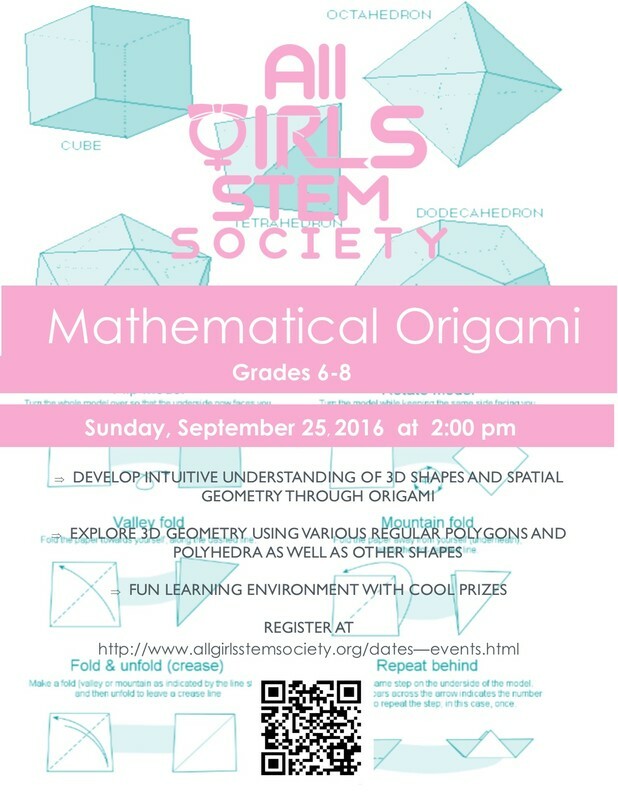 In this hands-on, interactive workshop, girls from grades 6-8 will develop an intuitive understanding of 3D shapes and explore the finer details of spatial geometry. Through creative work with paper, participants can develop their understanding of math and geometry and work with peers in a fun, supportive environment. AGSS would like to thank the San Diego Carmel Valley Public Library for its gracious support of the Mathematical Origami Workshop for grades 6-8. Participants get to explore the geometry of regular polygons and further develop their understanding of these shapes through origami. 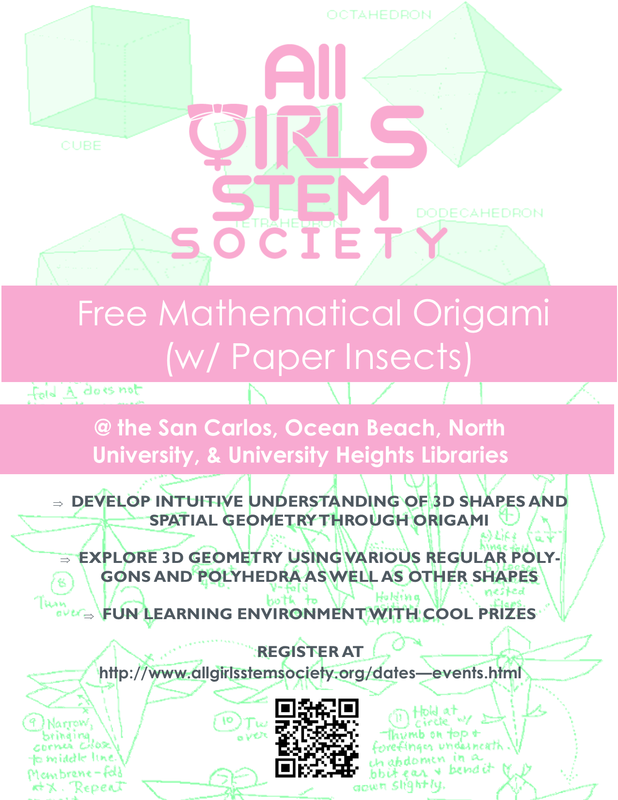 Girls from grades 3-5 will learn about geometric principles using various regular polyhedrons as well as other shapes in a fun learning environment with cool prizes. AGSS would like to thank the La Jolla-Riford Library for its gracious support of the Mathematical Origami Workshop for grades 3-5. All Girls STEM Society and Coding the Future presents: Python Programming with Technical Turtles, a two day programming getaway for girls from grades 5-8. 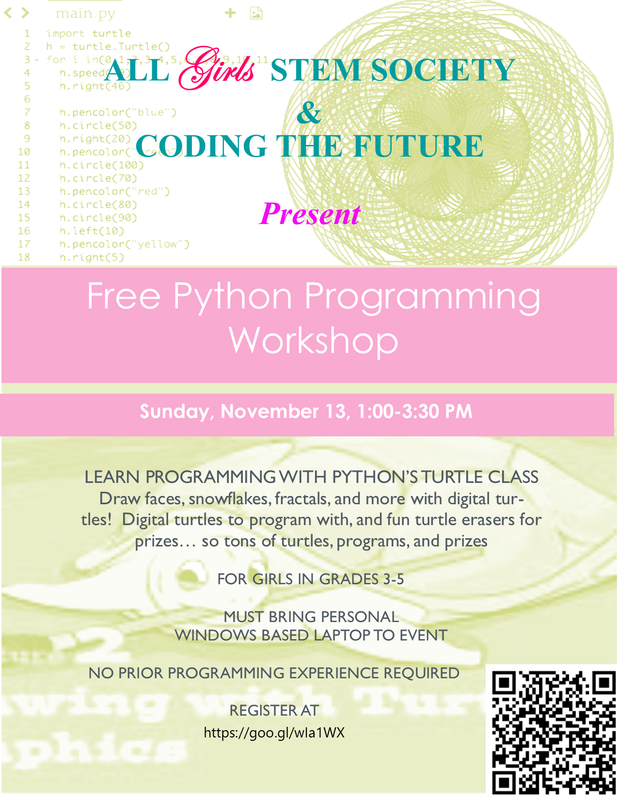 Learn programming with Python’s Turtle class - draw faces, snowflakes, fractals, and more with digital turtles! Digital turtles to program with, and fun turtle erasers for prizes… so tons of turtles, programs, and prizes. AGSS would like to thank San Diego Carmel Valley Public Library for its gracious support of the Python Programming Workshop. 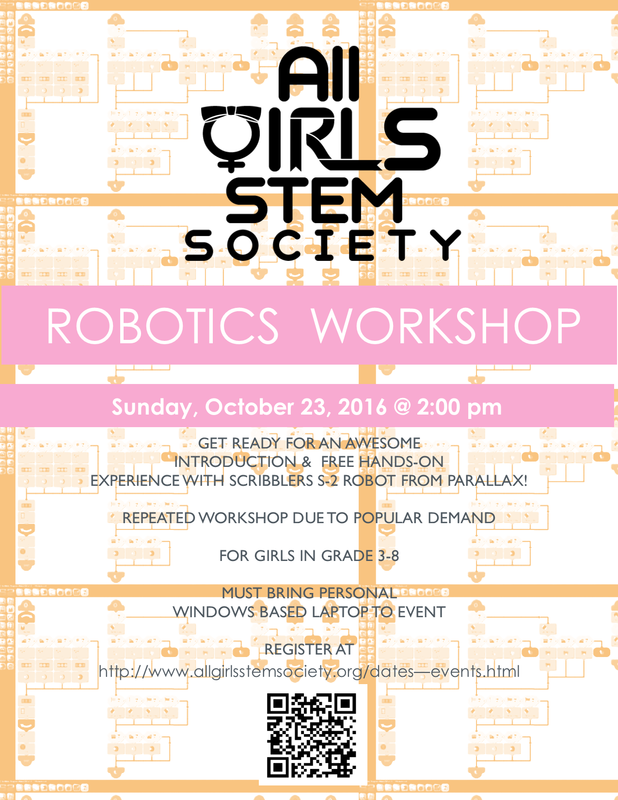 Get ready for an awesome hands-on experience with Scribblers (the S2 robot by Parallax)! Make these robots dance and draw! An introduction to robotics. AGSS would like to thank Ms. Shirley Miranda, Parallax, Mr. Milling of the Bishop's School, and San Diego Carmel Valley Public Library for its gracious support of the Robotics Workshop. Another fun girls' day out - with math! Challenging problems, team competitions, metals/cool prizes, cookies, and free t-shirts! 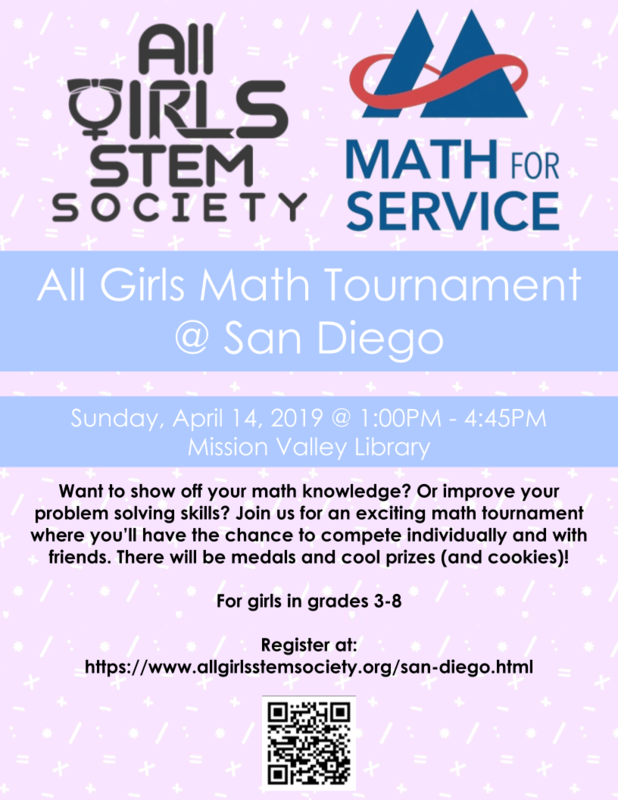 AGSS would like to thank Math for Service and San Diego Carmel Valley Public Library for their gracious support of the All Girls Math Tournament. All Girls STEM Society will be participating in this year's San Diego Science Fair Family Day! We will have a booth at the Balboa Park Activity Center. Come by to see recaps of this year's workshops, previews of future workshops, and some cool projects by our very own staff members! No registration, just stop by and support if you can! Prepare to blast off in an awesome workshop where you get to construct your very own paper rocket, fly it, and take it home! Learn about the basics of physics and real aerospace terminology & concepts used in the industry today. 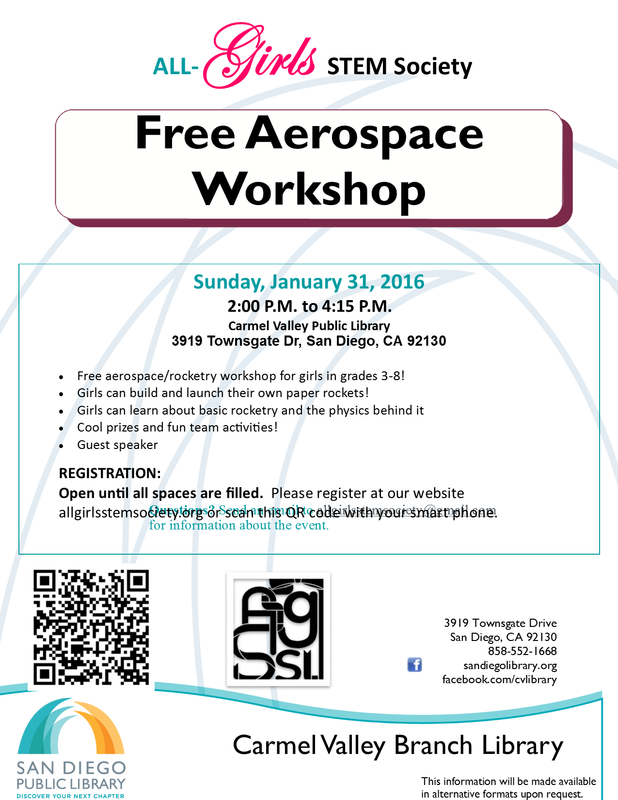 AGSS would like to thank San Diego Carmel Valley Public Library for its gracious support of the Aerospace Workshops. Lectures for both Math foundations and competition mathematics. 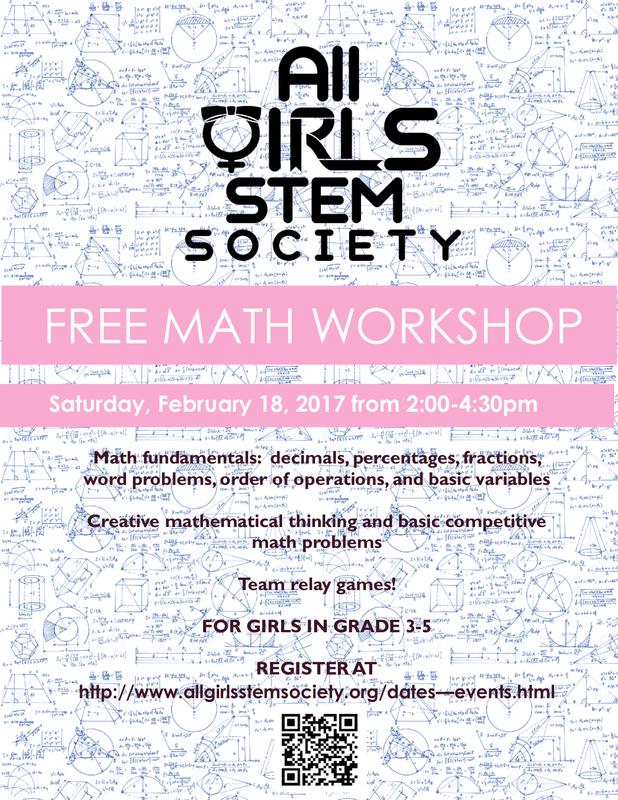 Bring a notebook and pencil and come to strengthen your math skills through games and activities! 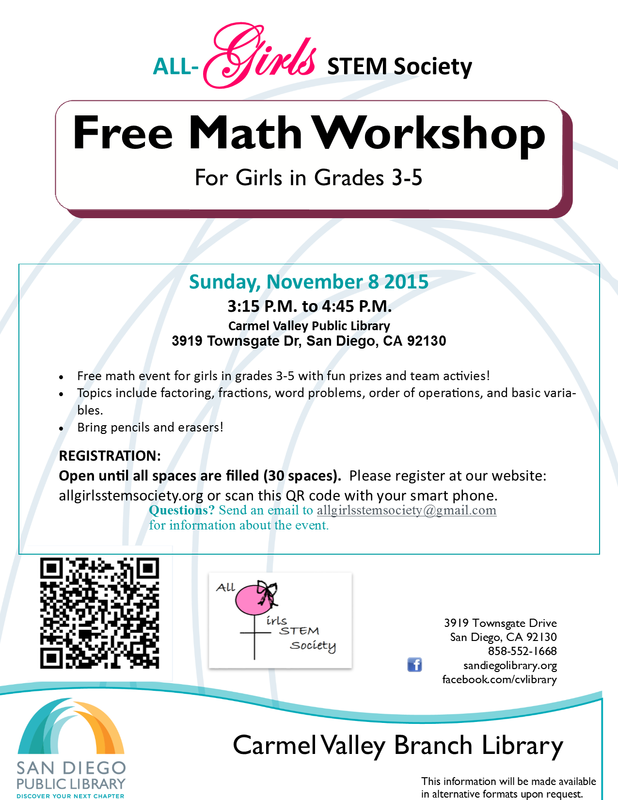 AGSS would like to thank San Diego Carmel Valley Public Library for its gracious support of the Math Workshops. Basic website development, fun hands - on experience! Please bring your computer for a day of programming - filled fun! Basic HTML & website development, fun hands - on experience! Please bring your computer for a day of programming-filled fun! 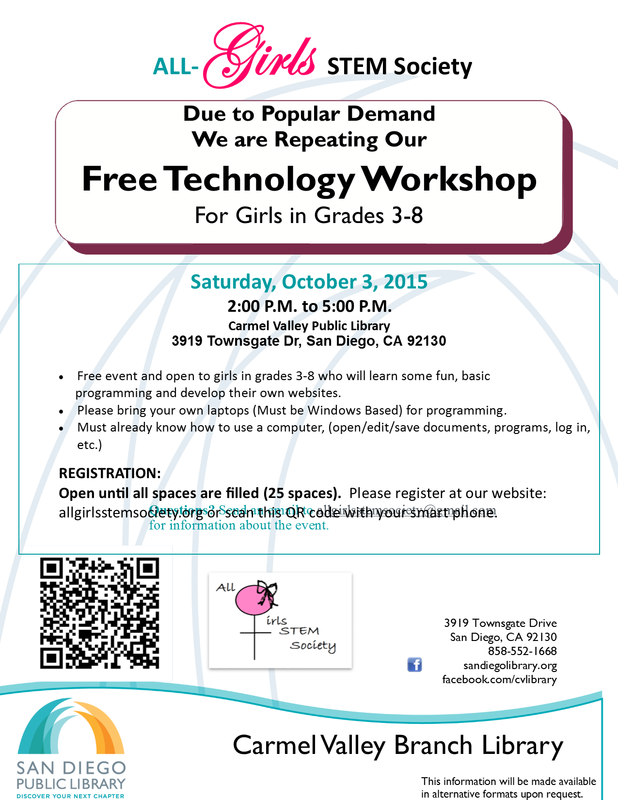 AGSS would like to thank San Diego Carmel Valley Public Library for its gracious support of the Technology Workshop.